My talk at The Next Hope (my conference writeup and photos here) was called Hacking for An Audience, and gives an overview of entertainment technology for live shows, details some of the ways we have "misused" technology in our industry, and also details some reliability strategies that we use to make sure that the show goes on. The conference organizers have now released free audio recordings of all the talks (I've downloaded many of the talks I missed for an upcoming road trip), and you can also buy videos of any of the talks here for a ridiculously low $5, with proceeds going towards conference expenses. I took the audio from my talk, edited the Powerpoint slides in, added a few bonus photos, and a bunch of links. Or download the audio here (clicking that link will download the mp3 file). I really enjoyed giving this talk and can't wait for the next Hope (2012). 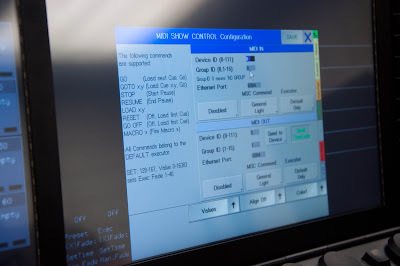 A revision of ESTA's BSR E1.17, the amazing "Architecture for Control Networks" protocol (ACN) developed by the live entertainment industry for control of pretty much anything, is up for a public review here until August 24. 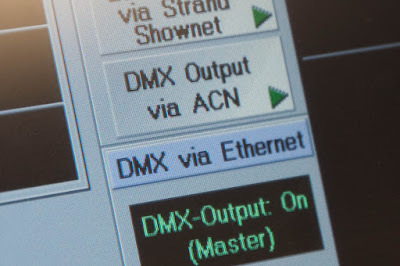 As I've written about extensively, ACN is an amazing control protocol that has some really cool potential applications far beyond entertainment lighting control. I personally think it is a great protocol for makers, hackers, and others, and there is a full open source implementation available and even a Wireshark plugin. Even if (like me) the details of this protocol are over your head, I'm hoping the whole industry will get behind this, because it could truly revolutionize the way we control entertainment systems. After years of work by my CityTech colleagues Charles Scott and John Robinson, we recently got a brand new MA Lighting grandMA2 system at the school. We got two main consoles: a GrandMA2 Full Size, and a GrandMA2 Light; a VPU Video Processing Unit; and network DMX processors. I was lucky enough to sit in on the excellent training session, done by Jason Baeri of A.C.T. Lighting, and I'm going to give you a little perspective on the console from a sound/show control guy's perspective. 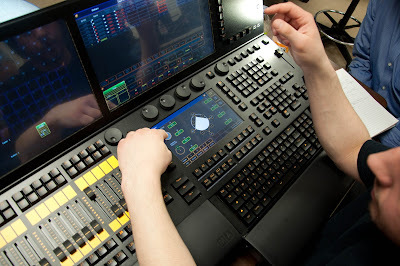 I used to know the ETC Expression series pretty well, but the last moving light console I really knew well was the Compulite Animator (for which I actually wrote a user manual when working for Production Arts). I never learned the Hog, or the original GrandMA, so my notes here are from that perspective. Also, the GrandMA2 software isn't quite 100% finished, so the training was in the original software, although we did see the system 2 software (some photos are system 1, some 2). Patching the console is very straightforward, with lots of help from the system to make things as easy as possible. Cues are built into "Sequences", which are then run using "Executors". "Pallettes" are like a modern version of focus points, allowing Cues to reference a point or state that can be changed globally across the show. One interesting thing about the console is that the faders are grouped into groups of five. This makes perfect sense, but it's also strange to me because so many audio consoles are in groups of eight (consoles are 8, 16, 24, or 48 inputs, outputs are in groups of 8, etc). 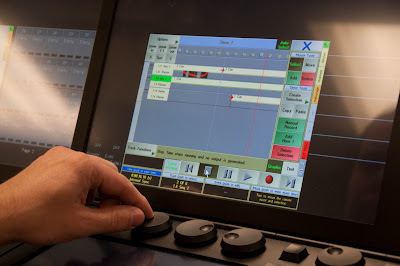 There are 30 executor faders on the full console, although multiple faders can be used to run a single sequence (for example, on a chase, one fader might be used for rate, and another for intensity). There are over a hundred pages of executors, all capable of running simultaneously. 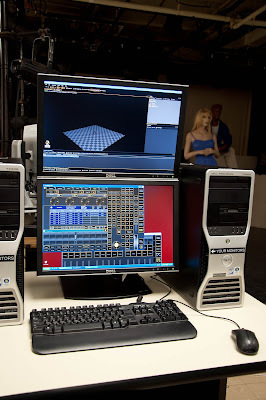 Much like with complex digital audio consoles, the days where you could easily track everything from one screen or layer are gone (but 3D visualization might solve that problem). Executors all have their own go buttons, or can be assigned to a global "Go+" button. (There is also a Go-). 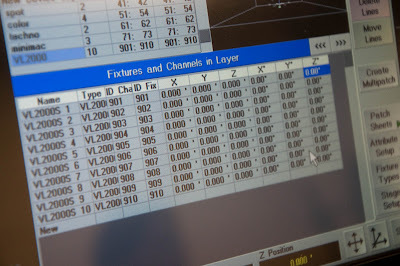 Fixture, parameter, and channel selection is done in a very sophisticated way, with lots of options, layers, and even conditional selection. 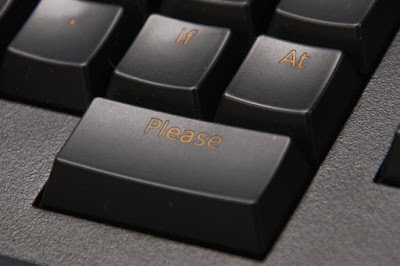 Notice above the "Please" (Enter) key, there is an "If" button. I only saw this used for conditional selection (for example, select every fixture with an intensity larger than 50%), but this is a very encouraging development, meaning that we can easily get more and more conditional kind of operations into lighting. 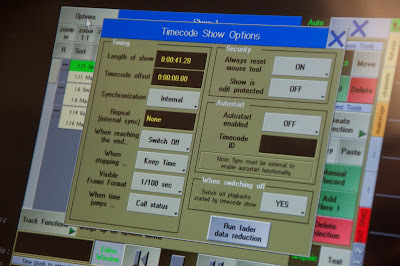 Time code can come in locally via LTC or MIDI, or over the network (we weren't clear on what MIDI protocol was used for network transmission, but I will follow up on that). However, I won't likely ever use MSC on this console, since the grandMA2 makes everything available via a command line and telnet interface over the network. I was a big advocate for MSC, but now I'm an advocating to get rid of it (see my write up here). I plan to use the network interface for the Gravesend Inn in the fall and will write that up when I get there. A very exciting (to a control geek) feature is streaming ACN! This is exciting, and lays the groundwork for some very cool stuff in the future with full ACN. These X/Y/Z positions are used today for the in-console visualizer and other functions, but more excitingly, this lays the ground work for 3D targeting of moving lights, something I've been advocating for since about 1987. All in all, the grandMA2 is a very impressive, well thought out, and well designed system. MA Lighting obviously "gets" the potential and the future potential of sophisticated control. I definitely commend them for that and look forward to really pushing this thing forward. Googling on my return from LDI, it turns out that the RSC above stands for Royal Shakespeare Company, whose Head of Lighting, Vince Herbert, is the device's inventor. TMB had a cool new product for control geeks--the ProShell, a little clamp that protects a RJ45 connector. I haven't used these yet, but I want to check them out. Let me know if you've got any experience with them. There was no one there to speak to us, but it looked pretty cool, and sort of similar to the Musion Eyeliner stuff. We tried to get it to dispense some bills, but apparently it wasn't working. F:light is a new product designed to bridge the gap between lighting and automation. 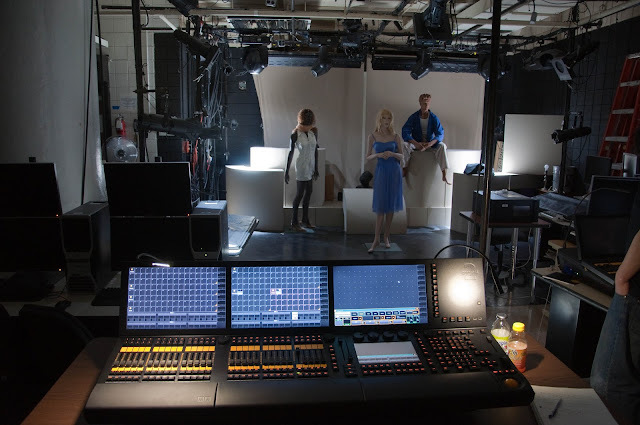 Developed by Stage Technologies, arguably the original innovators of automated 3D flying, it allows moving lights to automatically track moving scenery or performers, whilst remaining fully under the lighting designer’s control. 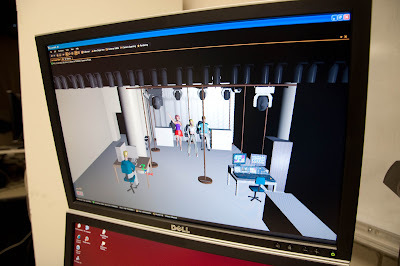 Stage Technologies has long been doing interesting and forward-looking work, and was one of the first to export its positional data for other systems to read. They did this in a custom way on Cirque du Soleil's Ka, and I have an article which details their approach here. The F:light data sheet says that the product supports ACN (streaming ACN, I assume) and this is great--in fact, this kind of thing is exactly what I described in my "The ACN Future is Here" article (copy here) back in 2007. If anyone has any experience with this system (good or bad), please post a comment!